Jun 1 Do Fidget Spinners Help Kids Pay Attention in Class? Right now, fidget spinners are all the rage. They’ve become so popular that they became a topic of discussion on my (Megan’s) local Rhode Island radio station that I listen to during my commutes, Lite Rock 105. Amy Pontes (@amyliterock105) brought them up because of their increasing popularity. She noted people have even been selling them out of the trunks of their cars! Recently, her daughter was desperate to join the craze, and Amy bought one for the daughter’s 10th birthday. Why was Amy discussing this on the radio? Well, after purchasing the fidget spinner for her daughter, Amy was surprised to learn that the use of fidget spinners isn’t backed by science. I immediately had two thoughts. Second, what claims are the companies selling fidget spinners making about these little gadgets? Is there some type of false advertising is going on? Or, are they relying upon research that doesn’t directly examine fidget spinners to make claims that overreach? What do other experts say? These small toys work using ball bearings. In their simplest form, kids can hold them between their fingers and let them spin. However, a search on YouTube will quickly show you how much some kids really can do with these things. Here is a video full of kids doing fidget spinner tricks. It was posted less than 3 weeks ago, and it already has over half a million views. These tricks are somewhat reminiscent of yo-yo tricks from our elementary school days. What claims are companies making? Kollins notes that because there’s such a large number of children with ADHD, and a lot of parents are searching for help, it makes them vulnerable to marketing ploys like the fidget spinners. We tried to look for evidence that fidget spinners really do help learning. But what we found was scientists talking about how the spinners could help in theory – but no empirical studies to back up these assertions (a search for “fidget spinners” and “ADHD” on Google Scholar yielded one hit: an unpublished honors thesis). 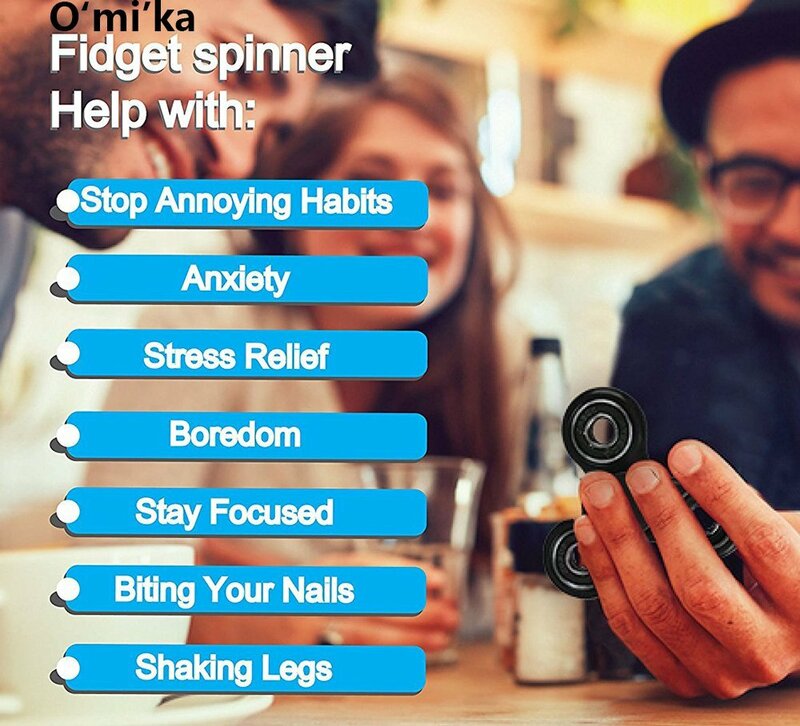 In fact, sensory treatments – which include the use of gadgets such as fidget spinners – do not appear to be consistently effective for treating disabilities (1); although occupational therapists do now frequently suggest this type of treatment, the science appears to lag behind in terms of evidence of effectiveness (2). Should you ban these from your home or classroom? As with any fad, there are probably pros and cons to these. For example, Amy Pontes (from the Radio) noted that she liked that her daughter was playing with her fidget spinner with her friends rather than spending a ton of time on screens. Some teachers have even used these to their advantage in their science classes to demonstrate principles of physics, like friction and the use of ball bearings to reduce friction. See also this article on the physics behind fidget spinners. There are other issues as well. For example, some have pointed to the fidget spinner fad and made ties to disability discrimination. Many are upset about how popular they have become among neurotypical kids. Bottom Line: For children with ADHD and Autism, these fidget spinners MAY help (at least some kids). However, we should be cautious while we wait for research to test fidget spinners empirically. Future research should also investigate when these might work to alleviate attention symptoms and when they may not. For the average student, we simply don’t have any scientific evidence to back claims that they help focus attention. Though, like with any fad, teachers may be able to turn fidget spinners into positive learning opportunities, and promote social play among children. (1) Barton, E. E., Reichow, B., Schnitz, A., Smith, I. C., & Sherlock, D. (2015). A systematic review of sensory-based treatments for children with disabilities. Research in Developmental Disabilities, 37, 64-80. (2) Zimmer, M., Desch, L., Rosen, L. D., Bailey, M. L., Becker, D., Culbert, T. P., ... & Adams, R. C. (2012). Sensory integration therapies for children with developmental and behavioral disorders. Pediatrics, 129, 1186-1189.